With the holiday season now in full swing, an annual Christmas ritual is set to get underway. 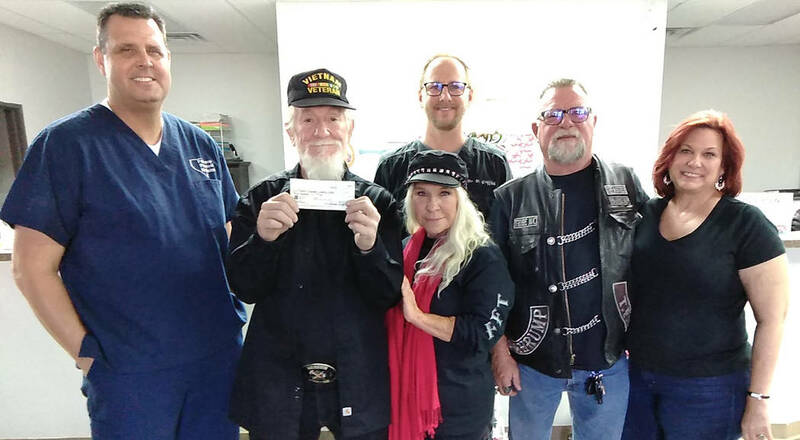 Selwyn Harris/Pahrump Valley Times Tribe Motorcycle Club President Ralph "Red" Pillman, holding a $500 check, is joined by his wife Joanna, along with Dr. Michael Taylor, left. Rounding out the group are Dr. Daniel Griffith, rear center, Tribe member "Caregiver," and Pahrump Physical Medicine employee Stacy Whetstone. The office at 2080 E. Calvada is accepting toy and monetary donations for the Christmas season. Members of the Tribe Motorcycle Club in Pahrump will be hitting the streets delivering hundreds of toys, including bicycles to local children who otherwise would not have much of anything to enjoy on Christmas morning, save maybe the spirit of the holiday. Tribe President Ralph “Red” Pillman said the group of riders have been performing the goodwill gesture for more than 20 years right here in Pahrump. Of those community members, officials with Pahrump Physical Medicine, formerly Affiliated Chiropractic at 2080 East Calvada, have provided much-needed support in the effort, as a recent $500 donation was bestowed upon the club. Dr. Michael Taylor noted this is the second year he and his staff have participated in the event. Taylor’s colleague, Dr. Daniel Griffith, said anyone who chooses, can drop off an unwrapped toy at the location, which is one of several around the valley. Pillman, meanwhile, said the age range for the toy drive is anywhere between one through 15 years old. Pillman also noted that the children and their families are selected and identified through various groups and agencies throughout the Pahrump Valley.